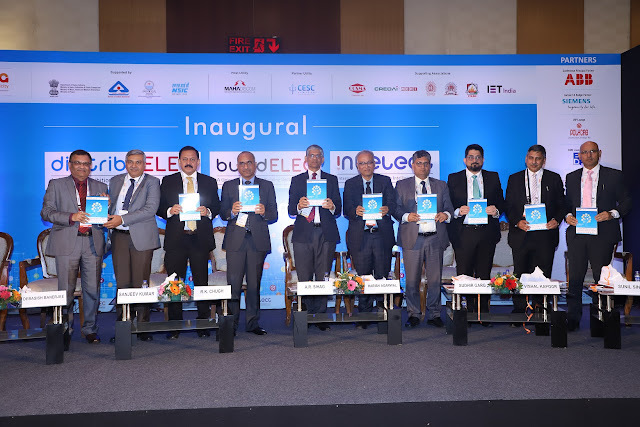 Indian Electrical and Electronics Manufacturers' Association (IEEMA) organised its third edition of distribuELEC 2019 from 4 to 6 February 2019. The exhibition brings utility, consumer, electrical operational technology (OT) and Information Technology (IT) on the same platform. Simultaneously with DistribuELEC IEEMA is organising its first edition of buildELEC and a technical conference Intelect 2019. DistribuElec 2019 was inaugurated by Shri. A. R. Sihag, Secretary, Heavy Industries, Govt. Of India, Sudhir Garg, Jt. Secretary, MSME, Govt. of India, Shri. Arvind Singh, Principal Sec. Energy, Govt. of Maharashtra, Mr. Sanjeev Kumar, Chairman and Managing Director, MSEDSL among others. Growth in load and distributed generation brings new challenges for distribution network. To overcome the challenges Utilities are also deploying state of the art technologies to improve quality and reliability of supply and also reduce losses. These challenges can be overcome only with the amalgamation of electrical equipment and digital network technology. It is in this backdrop that DistribuELEC 2019 is planned as a uniquely designed concept to bring Utility, Consumer, Electrical Operational Technology (OT) and Information Technology (IT) on same platform to empower all stakeholders. “DistribuELEC 2019 and BuildELEC2019 will provide the energy and construction industry an unrivalled environment to meet suppliers, all in one place. Participants will have the chance to meet with exhibitors and explore new developments. In addition, leading industry experts will share their knowledge experience in energy sector during 2 days interactive conference.” added Mr. Sunil Singhvi, Chairman, distribuELEC 2019. DistribuELEC is India's only exposition on Power Distribution showcasing products, technologies and services from 220V till 33kV in traditional electrical equipment like transformers, cables, capacitors, switchgears, meters, insulators, conductors and new age technologies in distribution automation & control systems, energy efficiency, demand response, advanced metering, communications technologies, cyber security, electrical fire safety and more. The exposition will provide a useful platform to source new and innovative product and service solutions, stay in touch with the latest trends, network and do business. BuildELEC 2019: The first edition of buildELEC has been planned to showcase convergence of OT and IT directly at consumer dwellings to make key utilization centers i.e. buildings -industrial, commercial and residential, more efficient and safe. Intelect 2019: The theme of the conference is “Towards smart, reliable, efficient and safe electricity”, this Conference is designed to sharing best practice in smart power. ELECRAMA 2020: The official launch of ELECRAMA 2020 will be held in Mumbai on February 4, 2019. Organised by IEEMA is the largest showcase of the Indian Electrical Industry ecosystem it witnesses the largest congregation of power sector ecosystem in the world. IEEMA is the apex association of manufacturers of electrical, industrial electronics and allied equipment in India founded in the year 1948. IEEMA members contribute to more than 95% of the power equipment installed in India. The Indian electrical equipment industry size is of USD 42 billion with exports of USD 6 billion. IEEMA plays a crucial policy advocacy role with government and its agencies. It works closely with standardisation bodies, R&D organisations and testing institutes for formulating Indian standards for developing energy efficient products. Technology deals with human as well as other animal species usage and knowledge of tools and crafts, Best Article Rewriter available.